Official name: The Republic of Tunisia (al-Jumhuriya al-Tunisiya). Tunisia derives its name from Tunis, the current capital, which, in turn, comes from Tunes, an ancient city. Some scholars claim that ‘Tunes’ is of Berber origin, etymologically derived from the Berber root t-n-s meaning ‘halt, bivouac, encampment’. The word ‘Tunis’ became ‘Tunisie’ as the name of the country during the French protectorate, and many European countries subsequently adopted the name Tunisia. 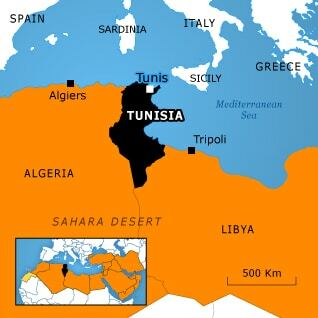 Tunisia, previously subject to various empires and states, emerged as an independent political entity in 1956. The country was long referred to in Arabic as Ifriqiya, a region encompassing modern eastern Algeria, Tunisia, and western Libya. In ancient times, Tunisia was famous for the city of Carthage. It was later occupied by the Romans, the Vandals, the Byzantines, and the Arabs. During Ottoman rule, Tunisia was known as the Regency of Tunis. Following independence from France, the country was known for one year as the Kingdom of Tunisia, until the Tunisian republic was declared in 1957. Even though Tunisia has been inhabited since ancient times, it has never managed to establish a level of wealth equivalent to that enjoyed by other countries in the region. Limited natural resources, coupled with economic mismanagement and corruption – which was rampant under the Ben Ali regime – have left most Tunisians struggling to make ends meet.